Thanks to my friend, Cat, she's pushed me out of a corner and encouraged me to make a card today. NOW, I'm in the mood. Thank you soooo much!! So this is my second post. And even more exciting is that both posts were for two challenges. 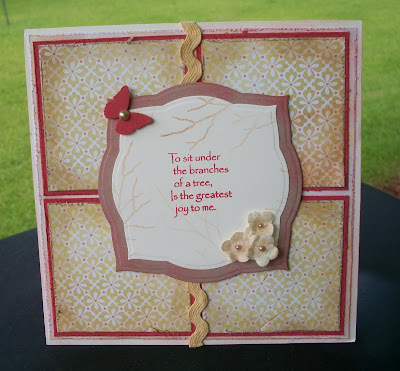 The first challenge is for Card Patterns Sketch 69 and can be found here. And the second one is for Impression Obsession to use at least one of their stamps and the color red. The card is 6 x 6. I used some real pretty mottled light beige Basic Grey paper as the first layer on top of my ivory base and wished I hadn't since it is not seen and I could have used an ivory and distressed it and you'd never know the difference. Lesson learned! I love distressing and aging. All edges were distressed using my scissors except for the base and the main image piece. Worn Lipstick and Antique Linen Distress Inks were used to age different panels. This was cut and embossed using the Labels 3 Nestabilities die with a second one the next size up cut from Kraft. Worn Lipstick Distress Ink was sponged on the edges of the Kraft and DSP. Tiny white flowers from Making Memories were sponged with Creamy Caramel and tiny Opaline pearls were placed in the centers. The one in the corner is raised on foam adhesive to lift it a little above the other two little cuties. 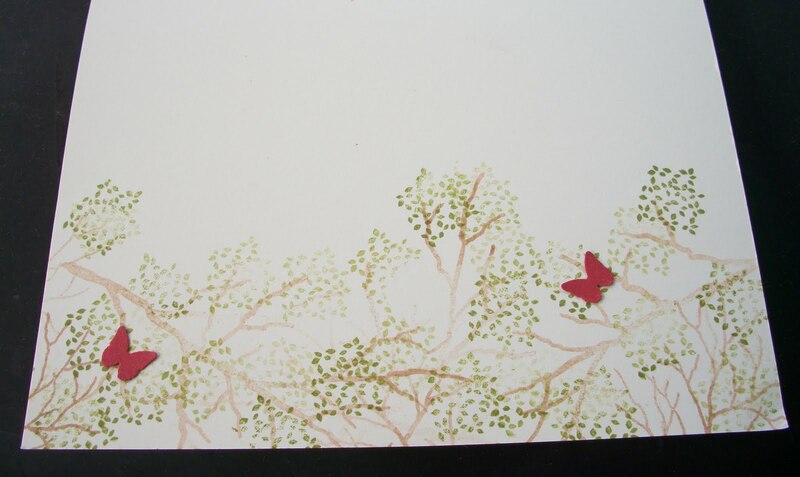 Martha Stewart's triple butterfly punch (a regular of mine) were cut from Ruby Red scrap. A larger Opaline pearl was placed in the center of the larger butterfly and raised with foam adhesive and put in the corner. 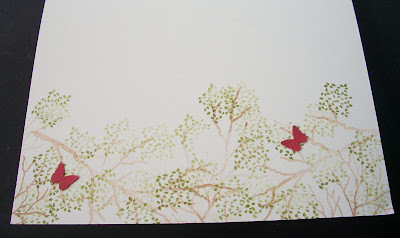 The inside was stamped first and second generation using one of the other branches and the other two little butterflies were randomly placed. I left these flat so it would be easier to mail. It looks like I've stamped the whole thing but it's only the bottom part of the card. Let me know what you think? Thanks! Robbie, Thank you so much for playing and your card is just beautiful! What talent! What a pretty card! Thanks for playing at Card Patterns! Robbie -- thanks for joining in the IO challenge!!!! Love the red edges -- they just pop right out!